Our May 2017 Woodstock Walk and Roll to School crew, after the walkers had already set off for school. If you’re like me, you love to celebrate active transportation (a.k.a. walking, bicycling, using a wheelchair, skateboarding, scootering, etc). On October 10th we’ve got the perfect opportunity to party because it’s Walk and Roll to School Day! With about two weeks until event, there’s still time to organize something at your school. 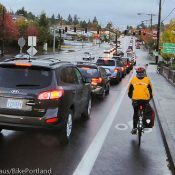 Thanks to the Portland Bureau of Transportation, every public school has access to cool free prizes, which you can sign up for after you register your school with The Street Trust (a nonprofit that contracts with PBOT on school-based cycling education). 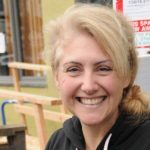 Don’t despair if you’re not in Portland because the National Walk & Bike to School website has tons of great resources, like their How to Plan page which offers a great primer on tips for first-timers, how to plan an event in seven days, how to make your event accessible to everyone, and more. We’re planning on a small and simple start at Woodstock Elementary this year. My plan is to meet at a nearby park a half-hour before the bell rings. We’ll have a small party with music, free prizes and snacks (we got a bit of funding from the PTA this year!). I plan to decorate our 0.2-mile walk along the park path with sidewalk chalk and hopefully snap a bunch of festive photos. Meanwhile, my co-volunteer (thanks, Carolyn!) will lead the bike contingent in a separate parade to the bike racks. We have grand plans going forward, like starting walking school buses and bike trains, having regular Bike Fairy visits, running more weekend bike rodeos and bike repair extravaganzas (a school parent is a bike mechanic), adding more bike racks, and working to better engage our Mandarin Immersion population. But it’s a marathon, not a sprint, and even a small celebration on the 10th is going to be big fun! If you’ve noticed there are two similar events — the May Walk + Bike Challenge Month/Bike to School Day and this October Walk + Bike to School Day — you’re not alone in your confusion. Here’s the history: the first Walk to School Day was held in 1997 and continues as International Walk to School Day each October; the first Bike to School Day was held in May 2012 and continues as National Bike to School Day each May. But they’re both “walk plus roll” nowadays to encompass all active transportation. 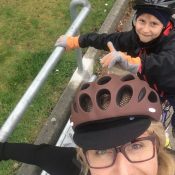 Personally, I felt a little bad about not accommodating our walking kids last May on Bike (and Walk) to School Day so I wanted to make our event this October very walker-friendly. And you need not have school-aged kids to feel like part of the fun. Back when my kids were toddlers, I had fun sharing #WalktoSchoolDay pictures on social media as we biked to classes. Have you participated in a walk and/or roll to school event before, or are you in the midst of planning one? Please share your tips or questions in the comments! Thanks for reading. This was just the kick in the hiney I needed. Exactly one child travels by bike at my granddaughter’s elementary school (yes, it’s her). However, I was told there is another family that would like to ride but haven’t quite got it figured out. The location is challenging, to say the least (traffic engineering failures). However, it’s doable. 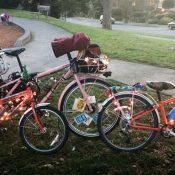 I’m hopeful that if I get the proper announcement in we can add to our fun by sharing the road/bike path with another family. Like Madi said, it’s totally okay to start out small! No first step is too small. 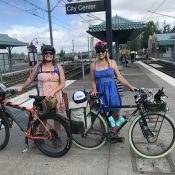 You can connect with me, and other people who support walking and biking to school at the Walk+Roll public group on Facebook. It’s a group that The Street Trust started. Nice photo of these children into biking when going to school. The local government should make more effort and policy for their safety on the road.